It’s always a pleasure seeing the Music Potential family grow and take on the industry. This week it’s the turn of one the projects most popular emcees FeeFee to step up. On Sept 8th he cordially invites you to his first showcasing event. 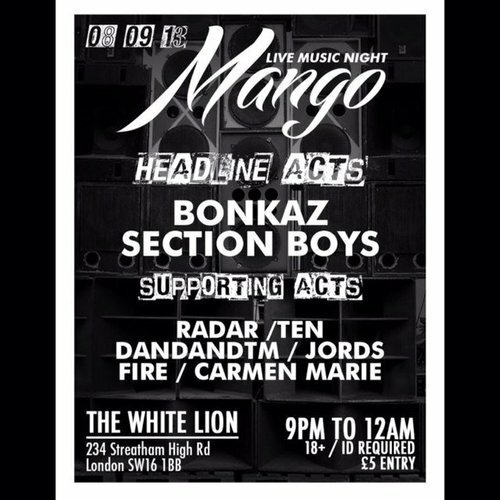 Come along to MANGO LIVE MUSIC and enjoy a night of live music from some of the hottest underground singers and rappers such as Bonkaz Section Boyz, Radar Stanna, Fire and Carmen Marie. This is a 18+ event and ID is required on the door plus a £5.00 entry fee. It’s going down at the White Lion on Streatham High road. See flyer for more information. Can’t think of a better reason to show our support… now get down there!